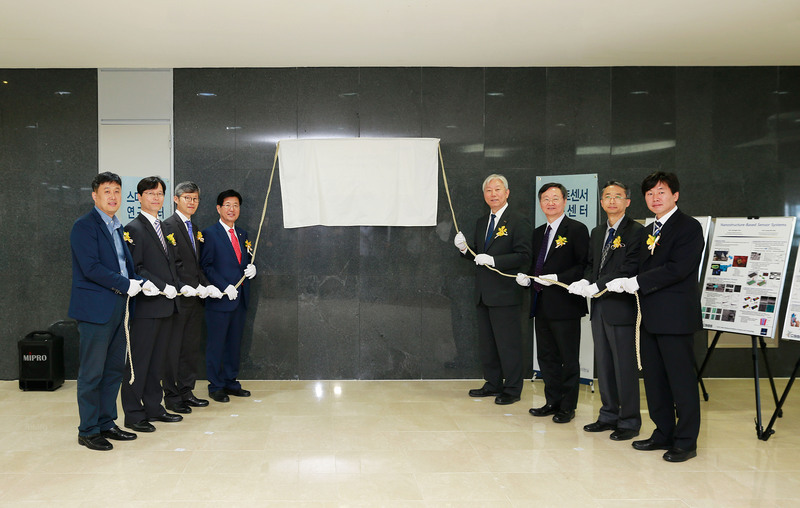 A signboard hanging ceremony of the CSSS was held at UNIST on Oct. 23, 2015. 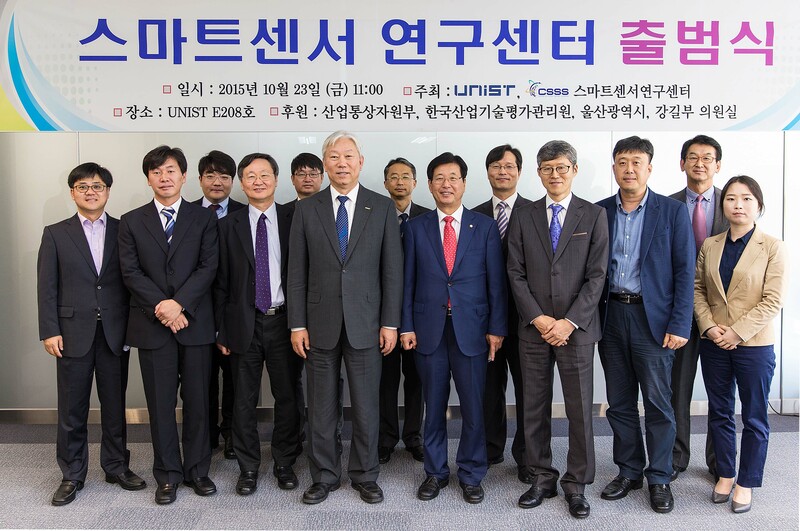 From left are Jung-Ick Kim (Ulsan Industry Promotion Technopark), Director Hyo-Derk Park (Smart Sensor Convergence Research Center, KETI), Director SungRyong Han (Electrical & Electronics Industry Evaluation Department, KEIT), Mr. Ghil-boo Kang (National Assembly), President Mooyoung Jung (UNIST), Jae Sung Lee (Vice President of Academic Affairs, UNIST), Prof. Sang Young Lee (Research Affairs Director), and Director Jae Joon Kim (CSSS). 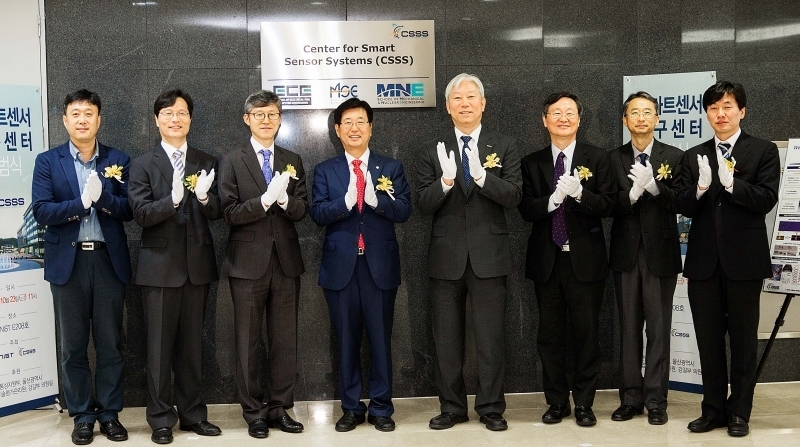 On October 23, UNIST held a signboard hanging ceremony of the Center for Smart Sensor Systems (CSSS) to commemorate the establishment of a state-of-the-art research and incubation facility, focused on the next generation of universal smart sensors. The ceremony was attended by more than 50 executives from the smart sensor industry and government officials, including Mr. Ghil-boo Kang of National Assembly, Director SungRyong Han (Electrical & Electronics Industry Evaluation Department) of Korea Evaluation Institute of Industrial Technology (KEIT), and Director Hyo-Derk Park (Smart Sensor Convergence Research Center) of Korea Electronics Technology Institute (KETI). The global smart sensor market is set to rapidly expand in the coming years, as it can be used across various industry sectors, like consumer electronics, automotive, industrial, medical, security and defense, and entertainment due to increasing use of sensing element and process controls in these sectors. Moreover, in comparison to conventional sensors, smart sensors offer various advantages such as high performance, high reliability, smaller in size, low power consumption, wireless, and required minimal interconnecting cables. Besides, not only can they monitor environmental conditions, they can be also used for other purposes like digital processing, analog to digital conversions, decision making, two-way communication, as well as logic functions. Formed to make UNIST a global leader in science and technology, the center will be the home of research aimed at advancing technologies that will make everything from automobiles, surgical devices, home appliances, and a host of other devices safer and more useful. Through a research driven multidisciplinary curriculum relating to all aspects of the sensing systems, including ‘smart-wearable sensors’, ‘smart sensor materials’, and ‘smart sensor interfaces’, the center aims at increasing the visibility and attractiveness of UNIST. And, more importantly, it will support collaborative research and development projects in the areas of smart sensors, distributed sensor networks, and Internet-of-Things technologies. “This center holds great potential for becoming another game changer for the Korean economy,” says UNIST President Mooyoung Jung.